Mark is available for workshops / seminars or speaking on the subject of job search for graduating students. Titled ‘Myths and Realities of Job Search’ this workshop is designed to assist graduating students entering the job market for the first time. It has proven its universal appeal and relevance in presentations to hundreds of graduating business, marketing, advertising and creative arts students. The workshops reinforce all the basics of job search, introducing the real skills and disciplines required for success. Content focuses on ways students can differentiate themselves from their competition, increasing their chances of landing that ‘first job’. Techniques and behaviors are practical, easy to understand and presented in a logical and entertaining way that can be immediately incorporated into any student’s job-search plan. The workshops emphasize the importance of building a personal brand image and reputation, especially during the job-search process. It includes basic business disciplines and life skills that will stay with the graduate forever. The workshops end with a Q&A opportunity to discuss specific concerns of the student group. Students walk away with practical ideas that they can use immediately, with profound results. Myth: The jobs go to the brightest. 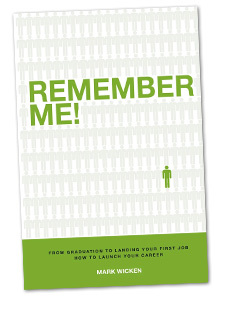 Mark Wicken, President of The Mark Wicken Group is an executive recruiter, educator and author. His work in the job search and career planning has led him to develop a unique, step-by-step approach to job search and the hiring process. This workshops will give every attendee the competitive edge needed for a successful job search.